While dining out in Boston and New York City these days, there is no denying a craze on the appetizer menu: kale salad. The trendy curly greens are a bit hipper than your traditional romaine chopped salad, Caesar, or Wedge. Not only is the amped up salad a pleasant accompaniment to a meal, it also adds an offbeat touch when doctored up with fun and seasonal add-ins. While at The Cleveland in Nolita, I enjoyed a curly purple, green and white kale salad with toasted hazelnuts, candied sunflower seeds, sliced fennel and carrot ribbons with a beet-tomato dressing. Most recently, in Harvard Square at The Sinclair, I dove into a bowl of Tuscan kale salad with goat cheese, walnuts, and charred apple vinaigrette; and a few weeks later while dining on the harbor-side balcony at Sam’s at Louis on Boston’s waterfront, I couldn’t get enough of the crunchy greens tossed with walnuts, sliced apples, Pecorino Toscano, and Caesar dressing. It was time to make my own version. I had never prepared a dish with uncooked kale, so sought The Kitchn for some tips. My intrigue in the green increased when I discovered that “massaging” the kale improves its flavor and texture. Once the bitter core is removed from a bunch, and the leaves are shaved and sliced thin, the shreds can be sophisticated a bit with a mix of pungent cheeses, toasted nuts, dried fruit, and a sweet, citrusy dressing. 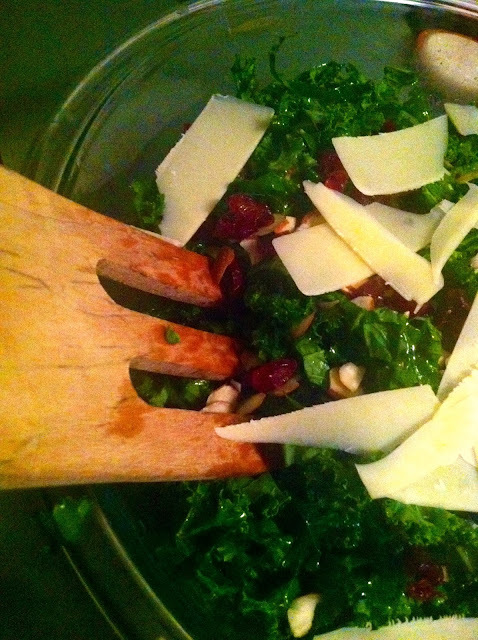 Kale salads are also great at a party since the leaves will not wilt completely, and will taste even better over time. Prior to preparation, clean and chop the kale and pour into a large bowl. Lightly drizzle the leaves with EVOO and a sprinkling of salt. Feel free to massage the kale with your fingers (or tongs). Set the bowl in the refrigerator for 20 minutes. Meanwhile, whisk together vinaigrette ingredients and set aside. Add the sliced almonds and dried cranberries to the large bowl. Add the vinaigrette and toss to coat. Let sit for an additional 5 minutes, then season with salt and pepper to taste. Sprinkle the Parmigiano Reggiano shavings on top and serve. Serves 4-6. Kale is also a superfood filled with healthy antioxidants!